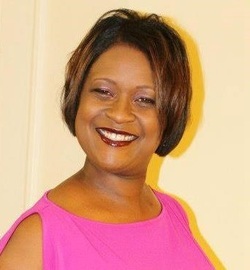 Danielle Woods is an American businesswoman and a member of Alpha Kappa Alpha Sorority, Inc the Chi Eta Omega Chapter. She is also active in her community. Danielle has been employed with State Farm Insurance Companies for 22 years and currently a member of the catastrophe services team. Danielle received her Bachelors of Business Administration in Computer Information Systems from Northeast Louisiana University (now ULM). She pursued Post-Baccalaureate studies in Speech Pathology and Sign Language. Danielle was born and raised in Bastrop, Louisiana by her grandmother, Dessie Jones. She is the only daughter of the late Deborah Lumpkin. She has lived in Little Rock, AR for the last 20 years. For many years Danielle was a HEROES volunteer. In 2010, she joined the HEROES Board of Directors.